Wishmaker Casino is one of new online casino sites to hit the market. This site is run by a team who are highly experienced in this market and with our Wishmaker review we can certainly see that is the case. The theme, the bonuses and loyalty program are all top class. 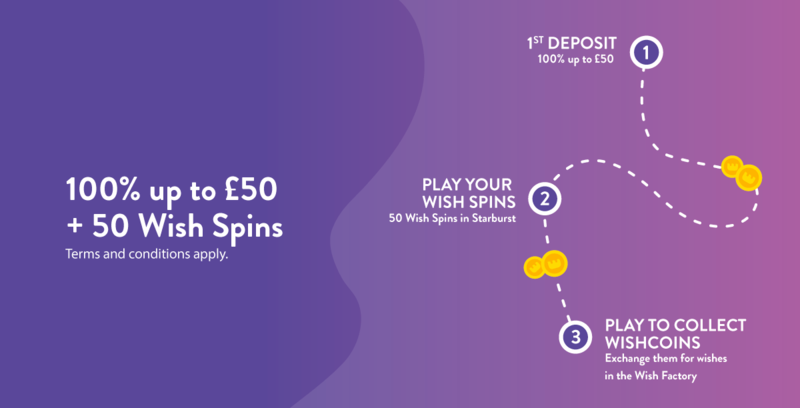 sign up today and get 50 wish spins and a £50 bonus. There are over 1200 games on offer from some of the best software firms in the business including NetEnt, Microgaming and Quickspin. The games on offer are mainly slots but there is a decent selection of table and live casino games. Dreams really can come true according to Wishmaker Casino – the online games site where there are over one thousand top titles to choose from, a bevy of bonus offers, live casino games, and free Wish Spins for new members. 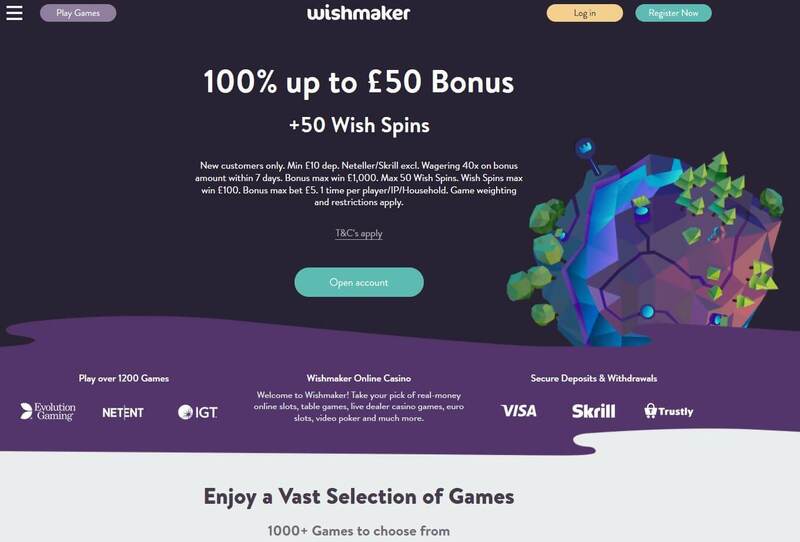 Wishmaker Casino is the brainchild of MT SecureTrade Limited, which owns many other popular brands including Cashmio, Guts, ShadowBet, Rizk, and Dunder Casino. To enhance the playing experience, members can collect Lucky Gems and Wish Coins, the latter of which can be used to purchase exclusive offers and deals in the site’s Wish Factory. 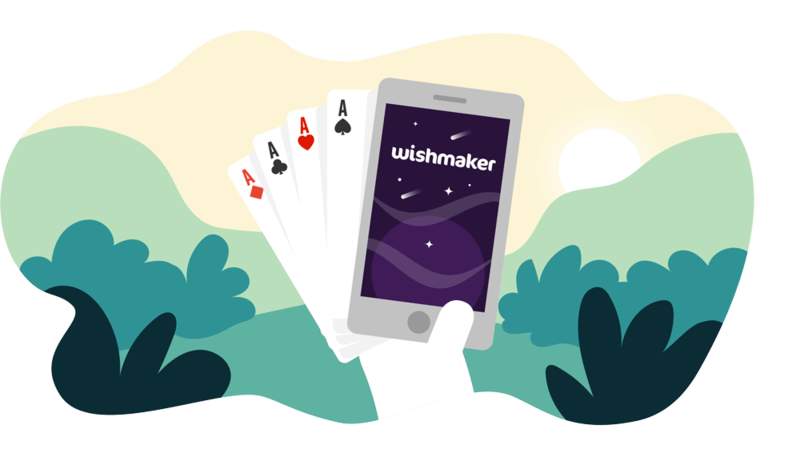 Wishmaker welcomes UK players as well as players from Europe, Germany, and Scandinavia, and like its sister sites, it’s licensed by the UK Gambling Commission, the Malta Gaming Authority, and the Swedish Gambling Authority. You can enjoy one of the widest collections of online slots on the market, including titles by Elk Studios, Bally Technologies, Merkur, Aristocrat, Betsoft, Shuffle Master, NYX Interactive, Novomatic, Thunderkick, Barcrest, WMS, Quickspin, Push Gaming, IGT, Yggdrasil, Big Time Gaming, NetEnt, and Microgaming. There are also two live dealer suites which are hosted by Evolution Gaming and NetEnt Live. Wishmaker Casino uses a fantasy theme that allows players to move through virtual worlds as they continue to deposit and play. Newcomers can benefit from guides on bonuses, tips on playing slots, banking, and how to improve your online casino experience, as well as FAQ, and there’s even a blog which helps keep you up to speed on all the latest news. Wishmaker Casino also has its very own side game called Wishing Well which is specifically designed to reward you with prizes such as cash bonuses, free spins, and Lucky Gems. Withdrawal requests are processed within a maximum of twenty-four hours, and a live chat service allows you to get instant help whenever you require it. When you join Wishmaker Casino and make your first deposit of at least £10 using any payment methods other than Neteller and Skrill, Wishmaker Casino will give you a 100% welcome bonus of up to £50 along with fifty Wish Spins to use on Starburst. Rather than using a traditional loyalty program, Wishmaker Casino lets you to collect Lucky Gems as you explore its virtual world and gain new player levels. Once you’ve collected three matching Lucky Gems, you can claim a reward such as free spins and bonuses. There’s also the Wish Factory where you can spend the Wish Coins that you’ve earned by depositing and playing games to gain exclusive merchandise, free spins, and extra bonuses. Plus, very soon, you’ll have the option to donate your Wish Coins to charity. Wishmaker Casino gives you a Wishing Well token when you achieve a new rank, and once you’ve activated it, you can play the Wishing Well bonus game which guarantees you a prize such as Wish Spins, cash bonuses, and Lucky Gems. The value of the prizes that are on offer through the Wishing Well bonus game increase as you gain higher ranks. The way in which the Wishmaker Casino website has been designed allow you to play via any supported mobile device such as an iPhone or iPad. According to the operators, iOS, Android, and Windows tablets and smartphones are compatible, and there’s no need to download an app as you simply log-in or create an account at Wishmaker Casino using your device’s web browser. The welcome offer is displayed on the landing page so that if you’ve yet to claim, you can do so with a simple tap as you open your account. If you scroll further down, you can see some of the most popular games that are available such as Starburst, Wolf Gold, and Rich Wilde and the Book of Dead, as well as the latest games like Temple of Nudges and Dwarf Mine. The menu system can be accessed by tapping the button at the top left, and it’s the place that you’ll find the Promotions, Support, and FAQ pages. 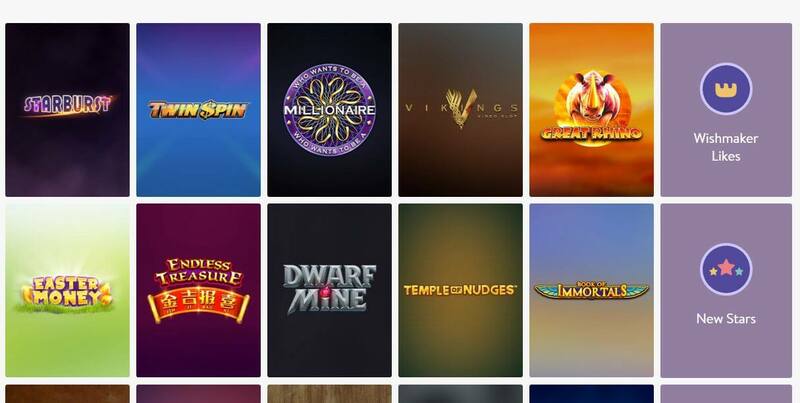 There are more than one thousand games to explore at Wishmaker Casino, many of which are online slots like Zeus III, Temple of Nudges, Vikings, Twin Spin, Starburst, The Great Albini, Danger High Voltage, Spin Town, The Finer Reels of Life, Sticky Bandits, Second Strike, Cash Spin, Dwarf Mine, Immortal Romance, Rise of Olympus, Extra Chilli, Wolf Gold, Temple of Treasure Megaways, Scudamore’s Super Stakes, Wild Gladiators, and Pirates’ Plenty: The Sunken Treasure. There are plenty of jackpot slots offering supersized jackpot prizes, including Mega Fortune, Joker Gems, Holmes and the Stolen Stones, Dancing Drums, Bell of Fortune, Golden Goal, and Mega Glam Life. In the live casino, you’ll find both Evolution Gaming and NetEnt tables where you can play everything from Auto Roulette, Immersive Roulette, Double Ball Roulette, Speed Baccarat, Dragon Tiger, and Lightning Roulette to Dream Catcher, Live Blackjack, Baccarat Controlled Squeeze, Casino Hold’em, Three Card Poker, and Texas Hold’em. Provided you’re logged in to your account, you have the choice of playing games with real cash or just for fun. If you need assistance, you can get in touch with the Wishmaker Casino via live chat between 8 AM and midnight from Monday to Sunday, email or online contact form. It’s easy to make deposits and withdrawals at Wishmaker Casino as there are plenty of payment methods to choose from, including ecoPayz, Skrill, Neteller, MasterCard, Visa, Paysafecard, Bank Transfer, Entercash, Trustly, EUteller, Zimpler, and Siru Mobile. Making a withdrawal at Wishmaker can be done in 4 easy steps. You first need to visit the Wallet section your profile, and click on Withdrawals, then select your withdrawal method and enter the amount you wish to withdraw. You then need to enter any further details as requested, click complete to finish the withdrawal. There are no fees for deposits and withdrawals, and if you cash-out via Neteller, Skrill, Euteller, Paysafecard or ecoPayz, you’ll receive your funds instantly. Wishmaker Casino withdrawal times is between 1-3 working days. Below is more details on the withdrawal times based on withdrawal option. Wishmaker Casino is a highly original site whose operator (MT SecureTrade Limited) has an outstanding reputation. There’s a massive selection of games to enjoy, and plenty of rewards to take advantage of as you collect Lucky Gems and Wish Spins and obtain new player levels. If you’re looking for an exciting and unique playing experience, sign up now to claim your 100% welcome bonuses and fifty free Wish Spins.